As you know, DME loves playing around with the window displays at our studio. For the latest designs, we decided to spice up the tables with extra color for a beautiful, bold look! 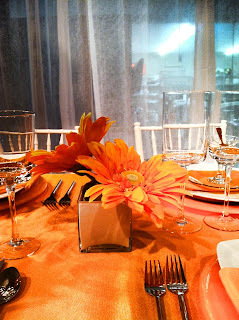 There are multiple ways to achieve this look using the table settings, chairs, etc., but we wanted to use the linens on the table to be the focal point of color, and use everything else as accent pieces! It may sound different, but thats the point! 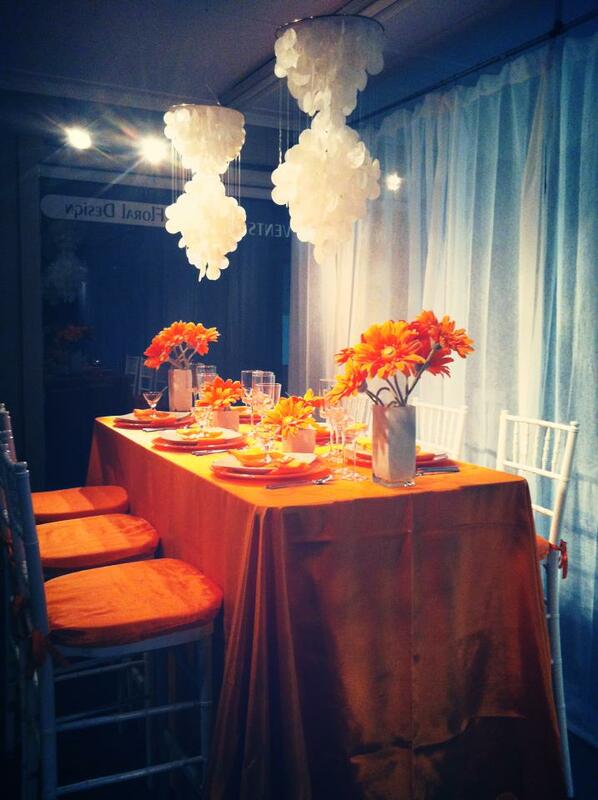 Above, you can see a smaller rectangle shaped table draped with gorgeous, bright orange linens! 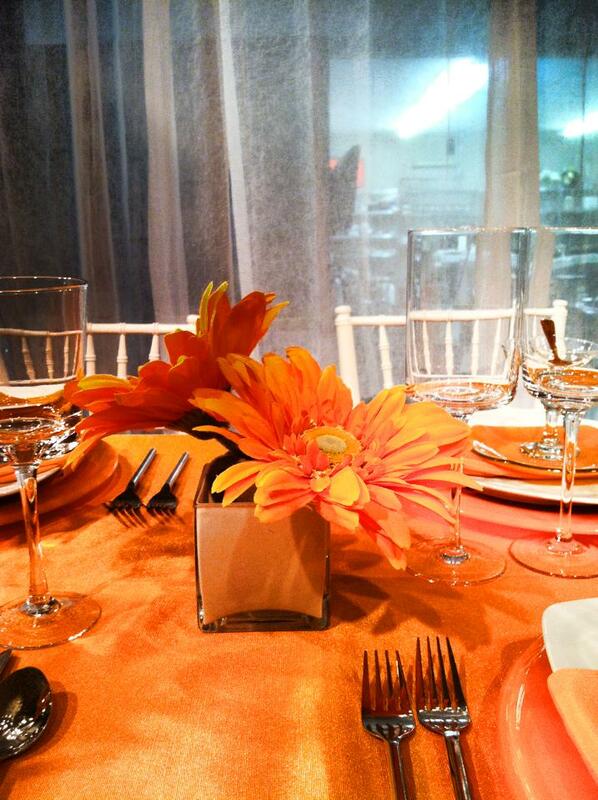 By using the same color flowers in smaller arrangements, it provided for a very simple yet elegant look. See what I mean by using the table settings as accents? 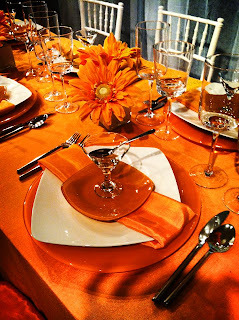 We used a set of plain white plates and two tall white vases to balance out the color. Here, you can see we placed two larger arrangements of the same flowers at each end of the table. We placed these flowers in tall, white, rectangle vases to compliment the simple and summery look of the rest of the table! Also, notice the hanging pieces from the ceiling? These are white chandeliers made out of seashells and make for a gorgeous finish to this tablescape. This look would be perfect for a summer lunch or dinner party with your friends, a graduation dinner, or even a romantic dinner for two...the possibilities are endless! Okay, now this look is a little bit more formal than the last one! Notice the texture of the linens? 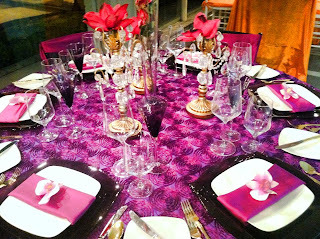 The detail of this design is absolutely gorgeous, and really gives the table a little extra oomph! 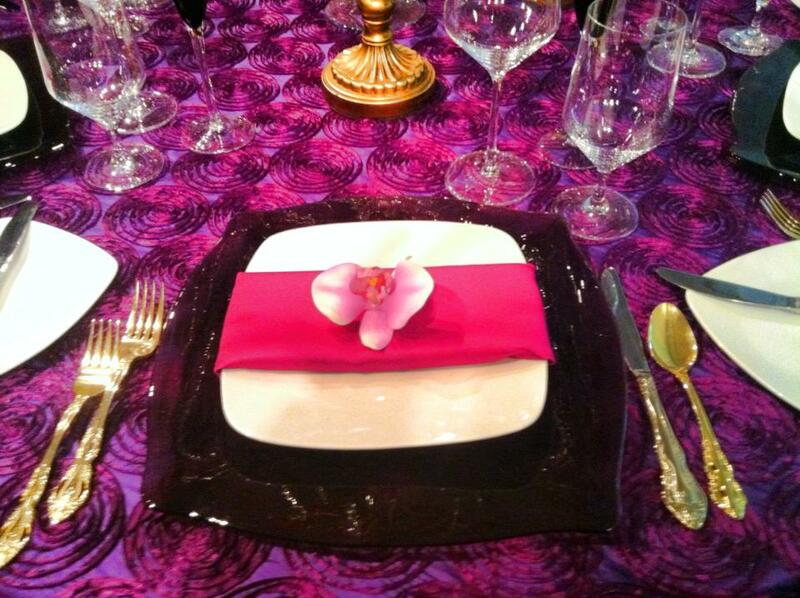 First, we chose silver ware that would compliment the rest of the design, and using gold on top of purple really makes it pop. Second, we used white plates for this table, as well, to balance out between dark and light colors. You always want to have something to subtly balance your pop of color! There is something about these chairs that I absolutely love! The soft knot at the top with the linens hanging down one side of the chair is such a different look than people are used to seeing! Forget about slip covers...why not decorate your chairs too!? Also, if you notice, the texturized linens are draped over a softer purple linen which gives the look great detail. 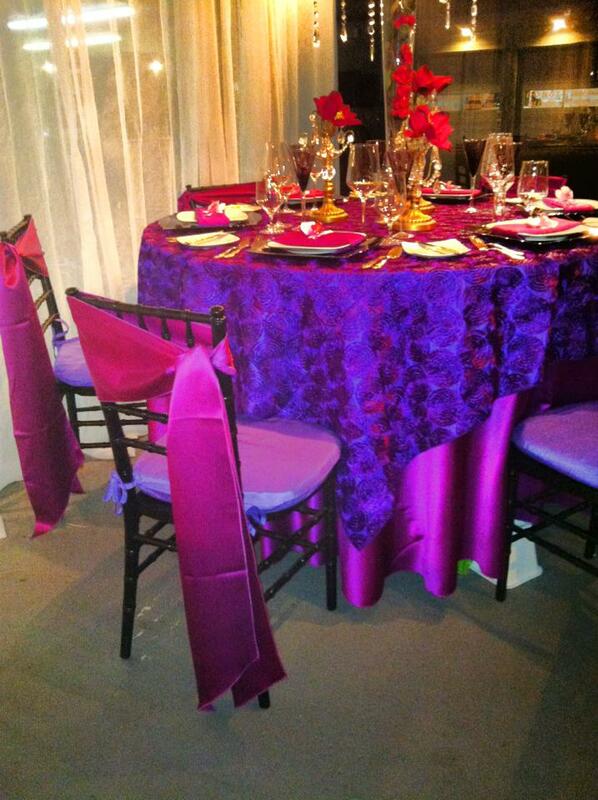 Now, who would have thought red flowers would look so stunning atop purple linens, right? 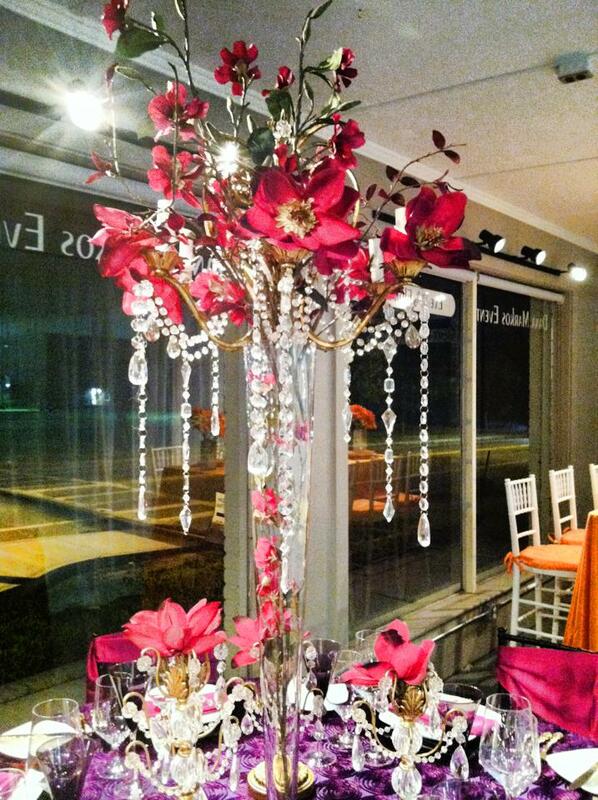 This lavish centerpiece, surrounded by smaller replicas, really finishes off this look of absolute elegance! We placed some of the flowers throughout the neck of the vase and hung diamonds from the top of the centerpiece for extra detail and sparkle! Whichever type of look you're going for - formal or casual - we hope you got some great tips from us! We love finding new ways to spice up our tables, and its so much fun to try new things, so don't be afraid to be daring for your next dinner party! Also, DME has been nominated for BEST WEDDING FLOWERS of Boston from the Boston A-list. We won last year and would LOVE to win for a second year in a row! We wouldn't be where we are without you, so please share with your family and friends and vote for Dana Markos Events!!! !